Sustainability is an ever-growing concept on Truman’s campus. Sometimes the sustainability efforts need an extra helping hand, and that’s where Becca Elder comes in. Becca Elder is a senior Environmental Studies major at Truman State. Elder is also the main Sustainability Intern on campus. In 2016, Becca proposed the idea of an internship to the President’s Sustainability Action Committee. Elder felt Truman had a lot of different environmental efforts which needed advocacy and coordination. Such needs could be organized by a sustainability intern and office. Collaborating with Donna Liss, Elder started on the journey of creating an office where students and community members alike could learn more about how to protect the environment. “The main goal of the office is to connect and promote. The office strives to cultivate an environmentally-conscious culture of students on campus. 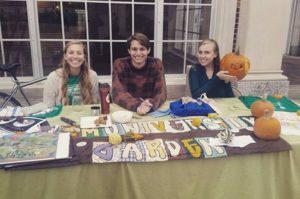 The [office] has information about how to get involved in sustainability-related organizations, environmental courses, and how to live more sustainably in Kirksville. The Office of Sustainability workers are also currently planning several events to bring different groups of people together around sustainability, including a World Water Day celebration, a local foods dinner/recycling fashion show in conjunction with Health Science students, ECO, and the Green Thumb Project, and a recycling drive,” Elder says. Becca partook in a Q&A session about how students could get involved in sustainability on campus, challenges and action plans of Truman’s sustainability, and her long-term goals. Q. What are some ideal characteristics of a successful sustainability intern? Q. How long have you been involved in sustainability work here at Truman? What are some events that you’ve taken part in or helped organize? Q. What does sustainability mean to you? Q. What is your strategy plan for getting students and the community more involved? Q. What would you say are the main environmental and economic challenges at Truman?